This article is about the TCG Booster Pack. For the OCG Booster Pack, see Gold Series (OCG). For the series of sets, see Gold Series (series). 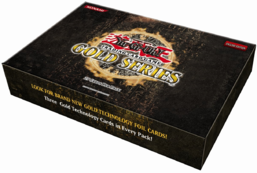 The Gold Series set is the first TCG set in the Gold Series series. It is followed by Gold Series 2009. As the first Gold Series series set released, it debuted the Gold Rare rarity in the TCG. Desirable reprinted cards in this set include "Jinzo", "Dark Magician of Chaos", "Mirror Force", and "Crush Card Virus". 25 cards per pack, 5 packs per box, 10 boxes per case. "Blue-Eyes Ultimate Dragon" was printed in this set with a DEF of 3000. This is a misprint; the correct DEF is 3800, and should be treated as such during gameplay. This page was last edited on 11 January 2017, at 19:13.